A Mala is a string of beads used to count mantras (Sanskrit prayers) in sets of 108 repetitions. You can use mala beads to meditate and you can wear the mala to receive its healing and spiritual powers. While chanting and using a string of beads is used as a spiritual tool in virtually every cultural and religious tradition, there is a very specific technique on how to use yogic or Buddhist mala beads for meditation and spiritual activation. The following traditional techniques will give you the most effective and efficient results for using your mala beads. The practice of chanting a mantra while using mala beads is called japa meditation. This style of meditation is used frequently in the yoga and Buddhist spiritual traditions. Japa meditation is generally performed while seated but can also be done standing and while walking. The mantra is repeated silently or aloud and can be repeated as slowly or as quickly as necessary to keep one’s attention focused. It is recommended to practice mantra meditation at least once per day. Meditating for at least 10 minutes will have the most benefits. 1. Find a comfortable yet well-aligned position for meditation. Traditionally mantra meditation is done seated on the floor. Cushions or folded blankets can be used under the sitting bones to keep the back comfortable. If seated in a chair have the feet flat on the floor and keep the spine straight–do not lean into the back of the chair if possible. Root down through the legs as you lift up through the crown of the head. Keep the shoulders relaxed and the heart open and lifted. The most common seated poses for meditation are Easy Pose, Accomplished Pose, Hero Pose, and Half Lotus Pose. 2. During japa meditation the eyes can be open with a soft gaze or the eyes can be gently closed. This helps bring your attention and focus inwards. Try to minimize all external distractions. A quiet, dimly lit room will be best for meditation. 3. The breath should be slow, deep and relaxed. Breath slowly in and out through your nose. Use diaphragmatic breathing during meditation–feel your belly expand outwards with each inhalation and contract with the exhalation. 4. Hold your mala in your right hand (in India the left hand is considered impure) and use your thumb to “count” each mantra by touching the bead during the recitation of the mantra. On each recitation lightly pull the bead towards you as you complete the mantra to moving to the next bead. The index finger is extended away from the hand and should not touch the mala or be used for counting. The large meru (mountain) or guru (teacher) bead should not be counted or touched by the thumb. It is used as the marker for the starting and ending point of the recitation. 5. Continue by pulling the beads with each mantra until you end at the meru and have completed 108 repetitions. (If you have a wrist mala of 27 beads you will need to repeat this 3 more times.) You can continue with the practice chanting multiples of 108 mantras. 6. 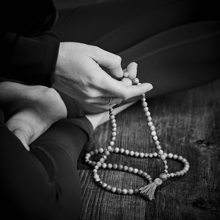 Keep your mind focused on the mantra and focused on the feeling of the thumb touching the mala bead. When thoughts arise shift your focus back to the mantra and the mala. Experiment with the tempo of the mantra recitation to find the pace that is most able to focus your attention. Some yogic and Buddhist traditions synchronize the breath with the chanting to further help to focus the mind. 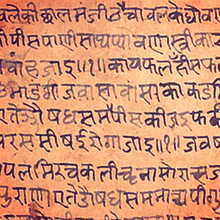 A mantra is a word or series of words chanted aloud or silently to invoke spiritual qualities. In the yogic tradition, a mantra is a Sanskrit word that has special powers to transform consciousness, promote healing or fulfill desires. A mantra is either given to you by a teacher or chosen by yourself. When selecting a mantra, be clear on what your intention is, and use your intuition over your intellect. You may want to try out each mantra for a few repetitions to see how it feels to you and choose the one that feels like it fits best for you. To empower the mala and the mantra used, japa meditation should be practiced each day for 40 continuous days. When the mala becomes empowered it can be worn or lightly placed on oneself or others to transmit the energy of the mantra as well as the energetic qualities of the mala. (It can be worn prior to this–it just will not have this amount of power yet.) When you use a new mantra with a mala, this energy becomes replaced, so it is recommended to use a new mala with each mantra if possible. 1. Wear a necklace mala around your neck. This is the most common way to wear mala beads. You can have the guru or meru bead down near your heart or you can wear it the opposite way with the guru or meru bead behind your neck. 2. Wrap a necklace mala around your wrist. You will need to wrap your full mala around 3-4 times to fit on your wrist. Not all malas will work as this depends on the mala’s length. Wrapping a mala isn’t recommended as it will put tension on the cord and reduce the lifespan of the mala. 3. Wear a bracelet mala around your wrist. This is the only option for wrist malas. If you find the tassel is getting in the way of your daily activities you can either flip the mala around during these activities or you can use a pair of sharp scissors to trim the tassel short. It is important to note that when mala beads are displayed outwards to people and the environment the power of the beads can be diminished. Thus it is recommended to wear your meditation beads inside your clothing if possible. This will not be as important if you are around friends or like-minded people and are in calm and nurturing environment. When not in use, store your mala in a special, clean and preferably sacred space. The great place to store a mala is on a personal altar or statue of a deity. We also sell beautiful mala bags and boxes to store your beads and sacred items in.